Have you ever felt slightly at odds with the world? As if you can’t really see where you fit in the world at the moment? When we feel like this, especially at mid-life, we begin to think the problem is with us and this causes worry or stress. Actually, it is perfectly normal to think like this, because it is a quirk in the way our minds work. The first thing to understand is that how we each see the world is as individual as our fingerprints. Each of us filters the world based on our beliefs, our values, our education, our upbringing which means we experience every experience we have differently from those around us. Even family members sharing the same experience will mentally interpret it differently. Take, for example, two children on a family holiday. They will experience the holiday differently, their age difference will have an impact because of their understanding of the world at their age and one will probably get more enjoyment out of the holiday than the other depending on the activities they do. The result is they will have slightly different memories of the holiday adding to their individual view of the world as they progress through life. As we experience more experiences it makes us even more individual in the way we see the world. Obviously we are not always so wildly different from everyone else. As we encounter other people in life there will be those we get on with and those we do not. If you take time to think about it, it is those whose world view is closer to ours that we get on with and those whose view is at odds with our own that we will avoid. All those times you have taken an instant like, or dislike, to someone new, it is our filters subconsciously working and assessing how this person will fit in to our life. It is our unique view of the world that makes us who we are and who we relate too. 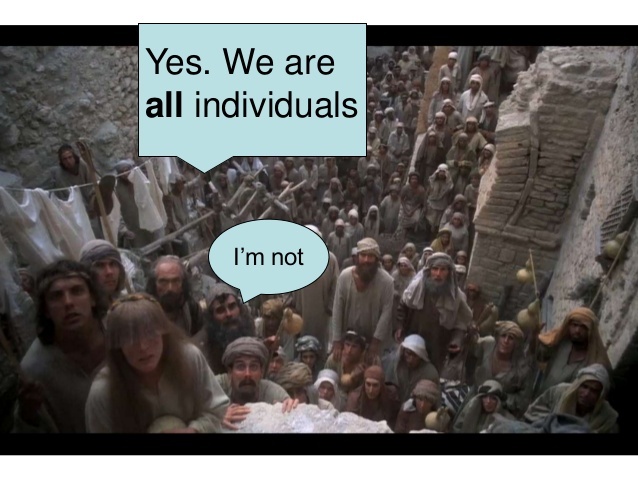 So YES we are all individual. While we are all unique we are also all hard-wired to conform. Conformity is a natural part of human evolution. The survival of the pack, tribe, community is dependent on those within it working together and coming together for the benefit of the community. It is the conformity within society that sets the rules and boundaries of acceptable behaviour (in a given time and place!). It is a powerful force used (and abused) by politicians, advertisers and anyone seeking to gain an advantage over others. So deeply ingrained is the need to conform that even those who rebel against conformity usual find some way to conform themselves – for example think about “rebellious youth” over time, Teddy Boys, Mods, Rockers, Punks, Goths, each developed their own way to conform, the clothes they wear, their music etc. Those who truly don’t conform in society are usually labelled as insane or as criminals. Naturally the degree to which the need for conformity affects us is dependent on our individuality but because of our individuality and our need to conform, every so often there are inevitably going to be clashes within us. Sometimes our individuality dominates and we feel at odds with the world other times we can be consumed by the roles we conform to and we feel that we are losing our identity, our individuality. As long as we understand that this is normal, because that is how human brains work, then we also know that there is no need to get to worried or stressed when it happens and we can work out why it is we are feeling the way we are at those times. The better we can develop our self awareness in all aspects of our lives the better we can move forward in life.